One of my favorite things in the world is practicing yoga. I am not especially great at it, but to me, that’s not the point. I love the flexibility yoga brings to my body and the openness it brings to my mind. I love that yoga is called a practice because no one is ever expected to be perfect. 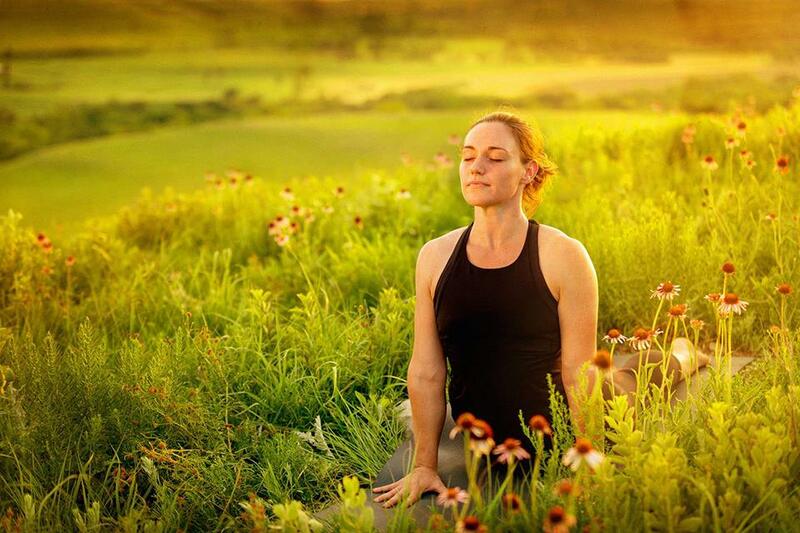 I asked my friend Jessa Baxter Voos, a veteran yoga instructor, to do a guest post in September, which is National Yoga Month. Her thoughts are so great, her post is going to be a two-part piece! Jessa and I met at her yoga studio several years ago and I have practiced with her ever since. She is not only a very gifted teacher, but she is a radiant person and a sweet friend. Please join me in welcoming her to Lemon Water! People always tell me they have been wanting to try yoga for years, but haven’t. They want to practice at home first so they don’t look “stupid” when they come. I hear they are too inflexible to do yoga. People assume everyone is going to be better than them. And people seem freaked out by the spiritual component of yoga. These are all jedi-mind tricks the ego has put in place, preventing someone from taking their first class. Opening the door, and actually crossing the threshold of the studio for the first time is the hardest part of yoga. After that, if you can begin to view your yoga mat as a giant welcome mat, you’ll soon realize this is a safe place. All are welcome. This is home. Allow me to try and ease your mind with some common comments. Coming into yoga for the first time can be intimidating. Anything new and unfamiliar is scary when we don’t really know what to expect. But what we do know, is there are pictures saturating social media outlets of yogis doing incredibly bendy, challenging things and this must be what yoga is. We automatically assume that when we go into a beginner yoga class, the teacher is going to ask you to do a Cirque Du Soleil-type act. And, most likely, you will fall on your face, be humiliated and laughed at. I’m here to tell you this is not the case. A good beginner yoga class will ease you into what yoga is. The teacher will talk to you on a level that you understand. And hopefully make you feel very comfortable and at home. The yoga practice is a process. Everyone started somewhere. The people you see in crazy pretzel positions most likely did not walk into their first yoga class and jump into these advanced poses. They, too, had to cross the doorway of a studio, facing their insecurities and learn just like everyone else. It’s hard not to put expectations on ourselves when we see these beautiful pictures. Do your best to talk yourself off the ledge of self loathing and internal put-downs and KNOW that it is okay to start at the beginning. Your beginning. This journey, the yoga journey, is a personal one. You have no one to live up to, no goal to reach, no ladder to climb. Yoga is a process of self-discovery. It unfolds physically, emotionally and spiritually in a different way and on a different timeline for everyone. This is what makes yoga such a beautiful process. When you can finally get past the idea that you have to “be” a certain way on your mat, it’s much easier to step into the studio. If you are not coming to yoga because you are inflexible, then you will never come to yoga. Being tight and inflexible is WHY you should come to yoga. Yoga helps open up our bodies. No one is going to ask you to do the splits (Hanumanasana) when you walk in the door. Again, it’s a process. Even if you forward fold with blocks under your hands because you are so tight in your hamstrings you can’t touch the ground, it doesn’t matter. At least you are there. A consistent practice will help you open up to eventually lower the blocks, then maybe touch the ground with bent knees, then maybe be able to straighten the legs, then maybe do a full forward fold. This process might take years, or weeks, or days – everyone is different. Even if your hands never come off those blocks, I bet you still feel the release that comes with stretching the body. And, if you never take that first step then you’ll always be using “I’m tight” as an excuse. Stay tuned tomorrow for the second part of this piece! Thanks Jessa for those inspiring words! I hear those same things everyday! My husband happens to be the worst (or best) at coming up with an excuse to not try yoga!